I am glad he felt inspired. I will say though, that he isn't going to find quality like the Four Peppercorn Blend that Joy's Teaspoon carries in a grocery store. This quality of Peppercorn is sought after and as you can see the blend is very pure. Joy's Teaspoon is Green Office Certified. What does that mean? It means that this company is environmentally savvy, use energy wisely, recycle, use recycled goods and use energy efficient products! You can connect with Joy's Teaspoon on Facebook, Twitter, Google + and Pinterest. Disclaimer: I received this product to sample for review purposes in exchange for my honest opinion. All opinions above are my own. I recently won a jar of Tropical Traditions Canadian Raw Honey and let me tell you I am super impressed with this product. First of all I had no idea what the requirements are for a honey to be considered organic and it is a little more strict than one might have thought. "In order for honey to be certified organic, the beehives must be placed in isolated areas miles from the dense population, industry, traffic congestion, and farm fields treated with chemicals and landfills. Second, a bee’s flying range is determined by their natural instinct which tells them to stay within their natural four mile range from the hive location. Finding area which can be certified organic is extremely difficult, which is why there are so few certified organic honeys on the market. Tropical Traditions sources its honey from hives in the wild frontier areas of Canada." Now I understand why it is made in Canada, we have the land to accommodate such a venture. This honey is incredible. Because it is raw and has never been heated it is solid unlike grocery store honey. 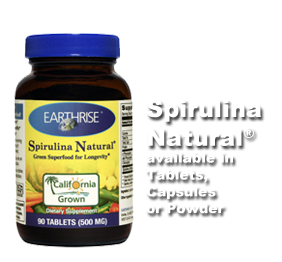 So it is filled with nutrients and beneficial enzymes. The resulting flavor is so pure and delicious it is like tasting honey for the very first time. I encourage you all to try it at least once, the benefits to the immune system are extraordinary. For the last few weeks I have been posting reviews of various GoGo Quinoa products. While this was delicious, I must say I did not enjoy the Mushroom and Quinoa soup nearly as much as the Minestrone. It is blander then the tomato based products that I have sampled so far. So for those of you who prefer bland foods or are required to follow a bland diet due to digestive issues, this soup might be right up your alley. My oldest son actually enjoyed this soup a great deal and he is a lover of spice. This soup is gluten-free, vegan and 70% Organic.You can make it with any unsweetened milk of your choosing. I didn't get to add the optional coriander or parsley to garnish the soup as it suggested on the back of the package, I do think that either would have complimented the soup quite nicely. 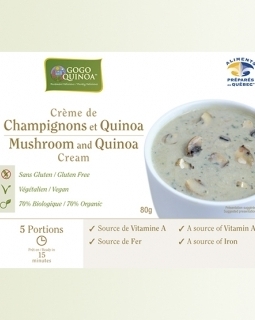 Ingredients: Organic amaranth flour, organic quinoa flakes, organic white and/or red and/or black quinoa royal grains, chopped mushrooms, mushroom powder, organic quinoa flour, carrots, organic onion, parsley, salt, organic garlic, organic turmeric. Disclaimer: I received this product for review purposes in exchange for my honest opinion. All opinions are my own. Naomi Rosen and I have two things in common: We both love tea and our mothers were both given the name Joy. Formed in 2010, Joy's teaspoon features a variety of teas and spices, many of which are organic and/or Fair Trade. The company that hosts their website is powered by carbon neutral and wind powered company. All of her products come in reusable tins or glass bottles. These are just a few of many of their Earth loving actions. I received 3 different teas to review and 3 different spices. Today I will review the Mahalo Green Tea. Made with green tea leaves, pineapple cubes, mango cubes, flavoring, safflower and sunflower blossoms 1 oz of this tea can be brewed multiple times. All you need to do is increase the brewing time by 1-2 minutes. 1 oz of tea from Joy's teaspoon can provide 12 -15 single cup servings. The tea is very sweet and really doesn't require sweetener, although if you must I recommend some raw honey. I'll let it slide this time! *winks* You can taste the fruity hints of pineapple and mango cubes throughout the tea. The tea leaves themselves are flavorful. I'll have you know I plan on spending the rest of the evening indulging in this never ending cup of tea. I made a whole pot, nothing like a hot cup of comfort. You can find Joy's Teaspoon on Facebook, Twitter, Google + and Pinterest. This book was written by Judith A. Belmont, MS who is a national speaker and corporate wellness trainer with over 30 years experience as a psychotherapist and Lora Shor, MSW. Lora is a national health and wellness speaker, an international corporate work/life consultant to Fortune 500 companies and a therapist. 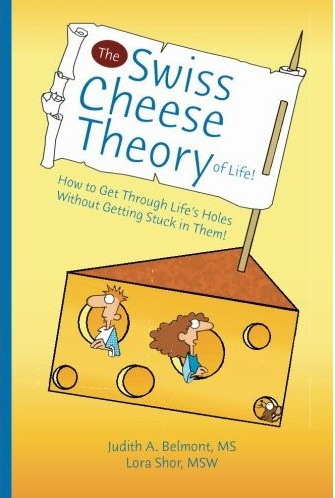 Instantly upon opening this book I was thrust into a world where at any moment I was behaving like one of three characters: The Swiss Wiz, The Swiss Cheese Fairy of Life, or the Negative Stinky Cheese. At first this whole notion while cute and fun, upon first glance seemed a little childish. I was concerned that some people might not take it seriously on account of such a playful analogy. It was my husband who shed light on this for me. He said that given the moods a person might be encountering while reaching out to a book like this, if it weren't written in such childish way a person might be too confused and flustered. As a result, they might find the average book with a similar theme of behavioral therapy a little overwhelming. I love him. About 5 years ago we went to couples therapy, we had within 3 months of one another experienced the death of very dear family members. In my case, a grandfather who was a fatherly figure and huge musical influence in my life and in his case the passing of his father that resulted in us adopted his then 4 year old brother. 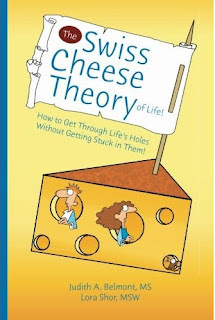 Much of the topics that were covered in this book were golden tools that were taught by our therapist that really helped us through our difficulties. Both my husband and I recommend this book to anyone who finds themselves thinking stinky. Disclaimer: I received a copy of this book in exchange for my honest review. All opinions are my own and based upon my experience with the book. 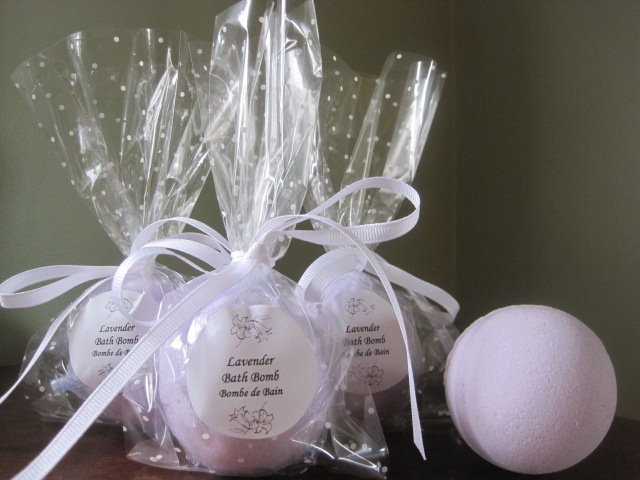 XenEssence Bath and Beauty is a Canadian based out of Ontario. They sent me a Lavender Bath Bomb, Pina Colada Lip Balm, Sweet Orange Un-petroleum Jelly and 3 other products that I will review separately to keep my review at reasonable length. The Lavender Bath Bomb was pretty impressive. I washed my hair prior to placing the bath bomb in the water and then just put it in an up-do to keep it out of the water. I knew that the bath bomb must contain a lot of oil if they thought it important to enclose a note making sure that I washed my hair first. Sure enough as the bath bomb dissolved in the water I noticed tiny little lavender oil globules all around the tub. The bath water felt soft and exquisite and my skin felt as moisturized as it does with the best of lavender scrubs. The Pina Colada Lip Balm wasn't thick like many lip balms on the market. It is very slick and non-greasy. It turns out the very first listed ingredient is Sweet Almond oil which is known for those attributes. This is probably hands down the best lip balm I have ever tried. It is more oily, less waxy and the oil is non greasy. It shines and it feels nice on my lips. The Sweet Orange Un-Petroleum Jelly is great for any application that calls for Petroleum Jelly, except this Un-Petroleum Jelly is Petroleum free! I have been putting a tiny dab on my lips at bedtime and also using a small amount on my elbows which have been dryer than usual this year. It has been pretty windy around these parts as of late and my lips can use the extra protection. The sweet orange scent is quite invigorating. You can find Xenessence Bath and Beauty on their website.